Prometheus was far less of a horror movie than its spiritual predecessor Alien, but director Ridley Scott still took a few moments to scare the living hell out of his audience, even if nothing quite matched an alien popping out of John Hurt's stomach. And though you can argue all you want about some of the movie's supporting characters, and whether or not their fates actually matter to the plot, the moment when crew member Fifield returns to the ship after being mutated by the alien goo is pretty intense-- and, as it turns out, could have looked a lot different thanks to Weta Digital. 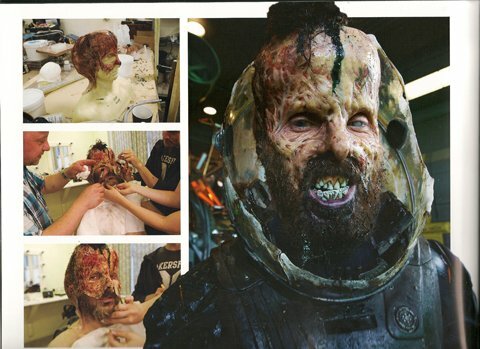 And below is an image, helpfully scanned by Movies.com, of what Fifield (played by Sean Harris) really did look like in the movie, a terrifying look create entirely through practical makeup effects. Maybe this is just my bias in these CGI-weary times, but I vastly prefer the look of the makeup-- it's creepier, it's more detailed, and it makes Fifield look less like a typical alien and more like some mutated monster. 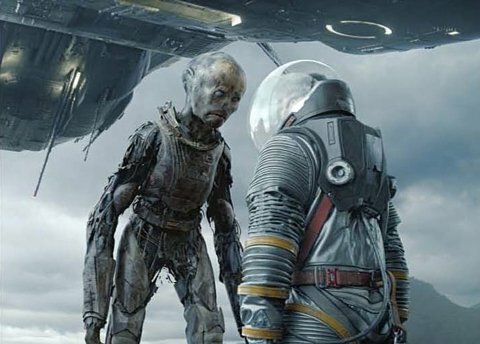 Then again, that more blatantly alien look would have helped answer one of the major lingering questions about Prometheus-- what does the black goo do, and why does it seem to have different effects on different people? Let us know in the comments which you would prefer, and for more on Prometheus, you can check out the gobs on special features on Blu-Ray release coming October 11.